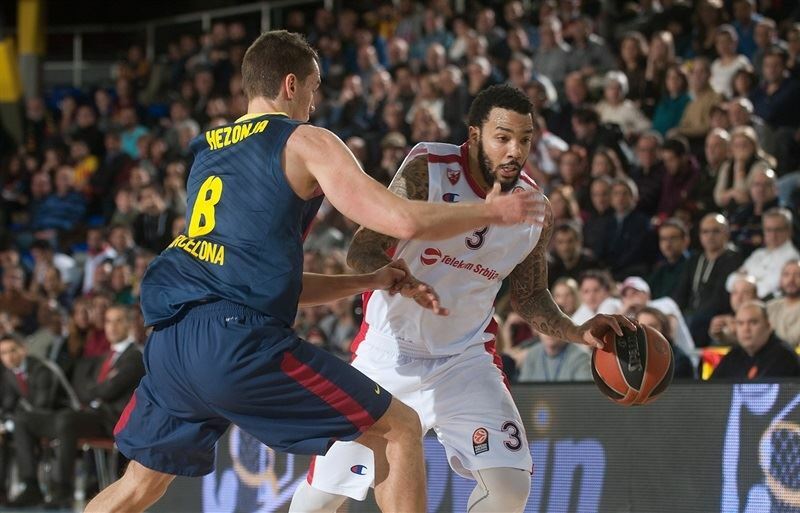 FC Barcelona got back to winning ways in Group E by downing Crvena Zvezda Telekom Belgrade 92-77 on Friday at home in Palau Blaugrana. 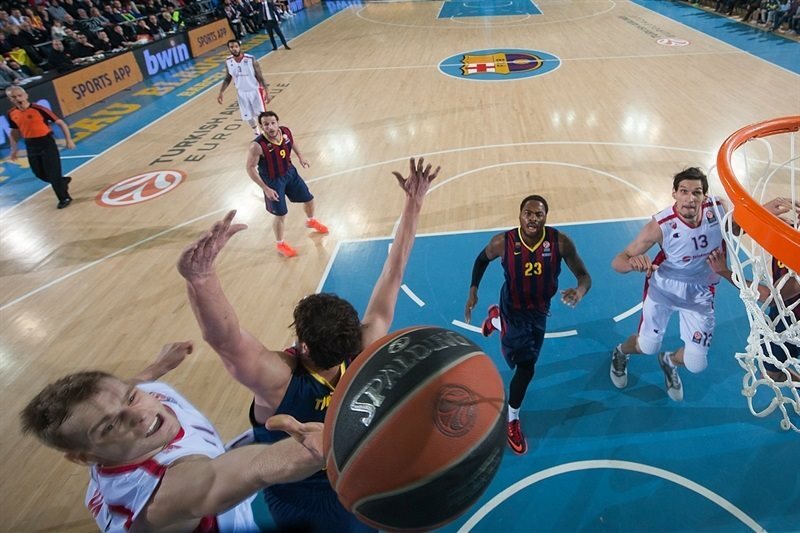 The victory improved Barcelona to 2-2 in Group E, while Zvezda dropped to 0-4 in its first Top 16 appearance. The hosts pulled away with a 12-0 run late in the second quarter that gave them a 49-38 lead at halftime. The visitors got within 53-46 early in the third quarter, but never closer. 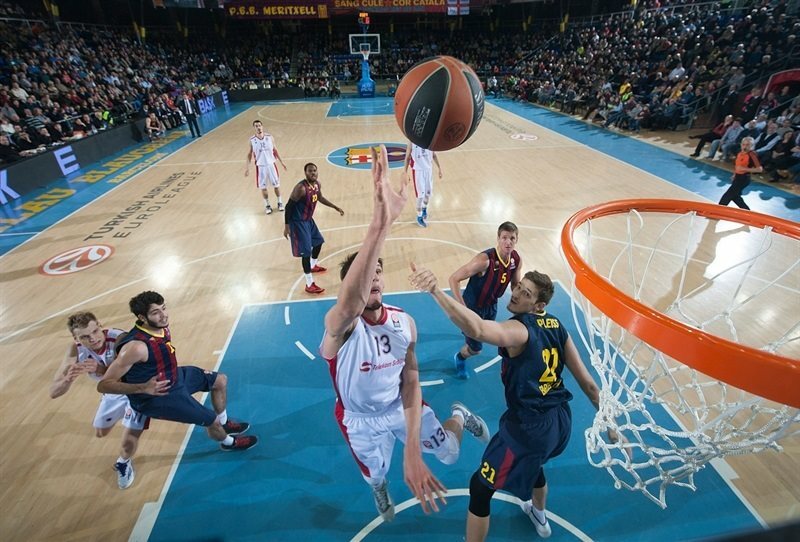 Ante Tomic and Marcelinho Huertas were creative with the ball, while Alex Abrines paced six double-digit scorers who kept increasing the margin, leading Barcelona to a comfortable win. 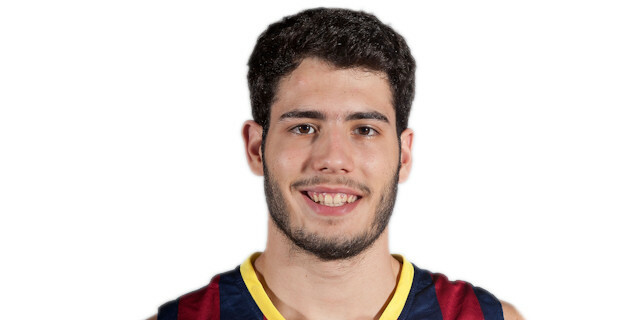 Abrines finished with 15 points, Tomic collected 12 points and 10 rebounds, while Mario Hezonja also scored 12. Huertas had 11 points and 7 assists, Justin Doellman also netted 11, while DeShaun Thomas scored 10 in victory. Jaka Blazic finished as the visitors' top scorer with 13 point. Boban Marjanovic had 12 points and 7 boards, Marcus Williams netted 11, and Stefan Jovic contributed with 10 points, 5 rebounds, 3 assists and 3 steals off the bench in defeat. Blazic opened scoring with a fastbreak dunk for the visitors, before Thomas got Barcelona going with a basket from close range. Tomic and Marjanovic traded inside baskets as Zvezda stayed ahead 4-6. 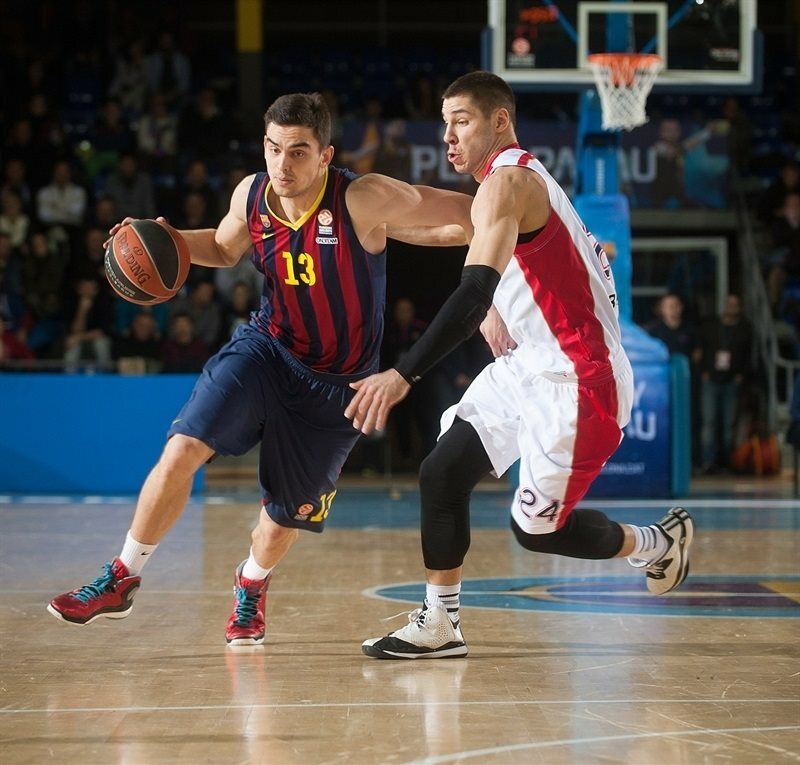 Doellman's three-pointer gave Barcelona its first lead, but Branko Lazic answered with a corner triple for Zvezda. A jumper from Abrines tied it at 9-9 before Marjanovic made a put-back and Doellman sank a jumper for an 11-11 tie. 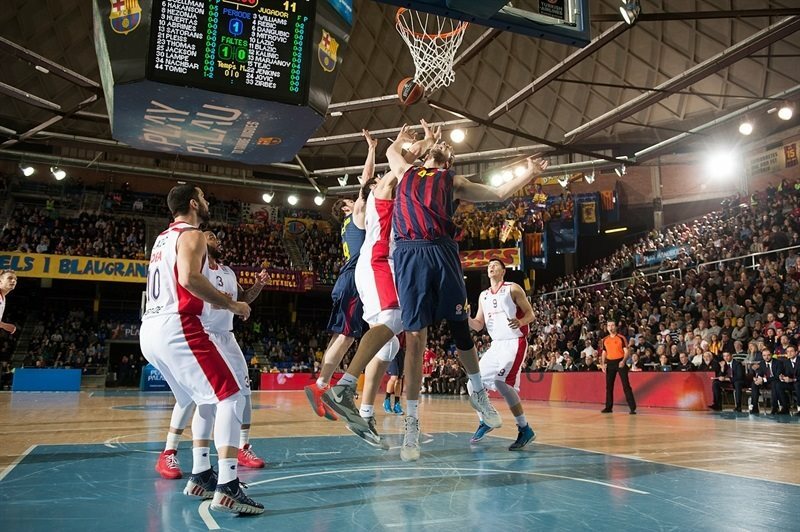 Barcelona scored its first five shots on the night, and a jumper from Doellman put the hosts back in front. After Blazic drove for a layup, Abrines and Williams traded jumpers, and Tomic scored a put-back for a 17-15 Barcelona edge. After a timeout, big men continued to produce, with Tibor Pleiss scoring a second-chance basket for Barcelona, and Marjanovic adding another layup to Zvezda's tally. 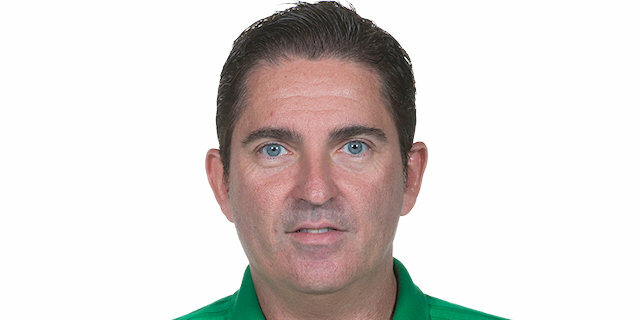 After Huertas banked in a runner at 21-19, the hosts kept Zvezda without a basket on six consecutive possessions lasting almost 4 minutes, while three-pointers from Thomas and Tomas Satoransky extended the margin to 27-19. Luka Mitrovic ended Zvezda’s drought with a late layup that made the score 27-21 after 10 minutes. 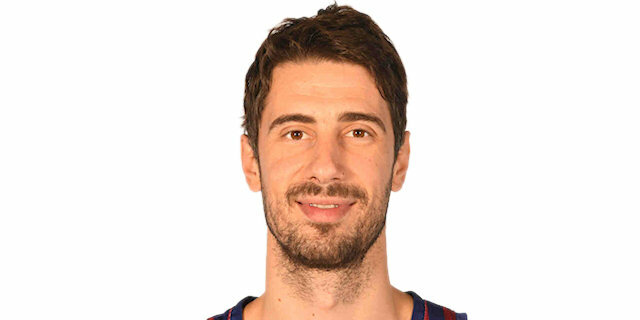 Mitrovic made a pair of free throws and Jovic drove for a layup to get Zvezda within 27-25 as the visitors held Barcelona scoreless for exactly 3 minutes of the second quarter, until Pleiss scored from close range. 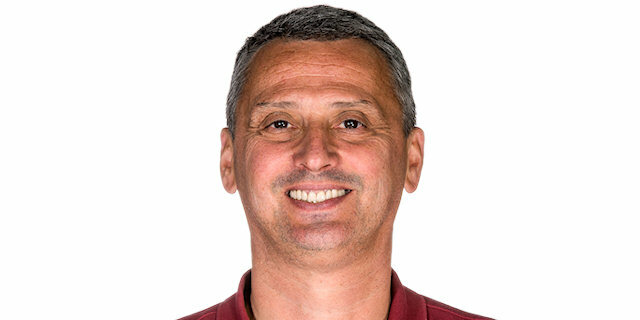 Charles Jenkins drove through a crowd for a layup, and after Abrines made couple foul shots, Nemanja Dangubic and Kalinic scored inside for a 31-31 tie. Hezonja and Kalinic traded triples, before Huertas buried one from downtown to restore Barcelona's lead at 37-34. Williams drove for a layup, but a put-back and a three-pointer from Hezonja helped extend the difference to 44-36. After a timeout, Hezonja came up with a steal and Abrines knocked down a triple in transition for a sudden double-digit lead, 47-36. Doellman hit a jumper before Marjanovic made a pair of free throws to snap a 12-0 Barcelona run and make it 49-38 at halftime. Marjanovic dunked and Tomic scored from close range to start the third quarter. After Lazic drove for a layup, Tomic secured a couple of offensive boards for the hosts and fed Huertas for a runner off the glass at 53-42. Lazic made a tip-in for the visitors and Mitrovic scored a pair from the foul line to cut the deficit, but Tomic fed Huertas with another nifty bounce pass, and Abrines sank a triple to restore a double-digit advantage, 58-46. After a driving layup by Jovic, Thomas had a monster two-handed reverse dunk. Kalinic hit a layup, and after Thomas answered with a baseline dunk, Jovic put back a miss by Marjanovic at 62-52. Doellman was in a right place to scramble for a layup and Marjanovic fought for another second-chance basket. Huertas worked his way inside for a layup, but Blazic bettered it with a layup-plus-free throw to get Zvezda within 66-57. Barcelona's ball movement left Pleiss alone in the paint for an easy dunk, and after Dangubic finished a fastbreak on the other end, Pleiss hit a long jump shot for 70-59 Barcelona advantage after three quarters. At the start of the fourth quarter, Jovic made a pair of short jumpers around a layup by Tomic. Hezonja hustled for an offensive board, followed it with a couple free throws, and then used an assist from Tomic for an easy baseline dunk and a 76-63 scoreboard. The hosts kept hustling defensively, while Abrines knocked down another three-pointer, his third, for a 16-point margin. 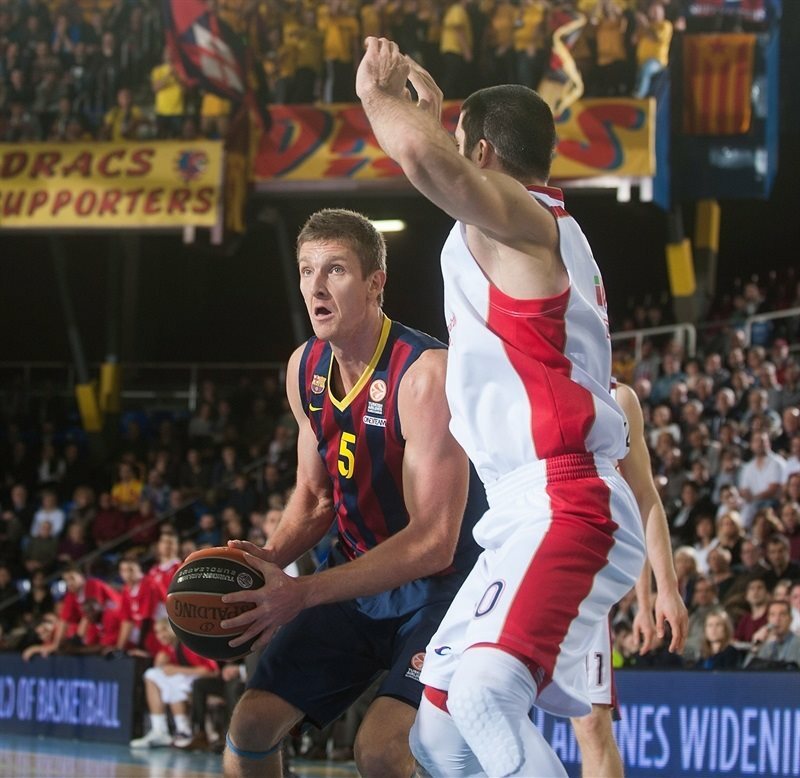 Blazic and Tomic traded baskets from close range before a Satoransky put-back made it 83-65. With game out of reach, Williams sank a triple for Zvezda, but Lampe countered with a baseline jumper at the other end. Blazic and Lampe exchanged baskets inside, and Lampe’s free throws pushed the margin to 90-70 with under 3 minutes to play. In the final minute, a pair of baskets from Maik Zirbes cut the deficit, and after Lampe scored a layup, Marko Tejic rounded out the scoring with a three-pointer. "I am very happy with the victory and also the points difference. We played very well on offense, less so on defense, especially in the first quarter. But later we got better. The margin of 11 points that we achieved near the end of the second quarter was the key, and we were able to maintain it in the second half. 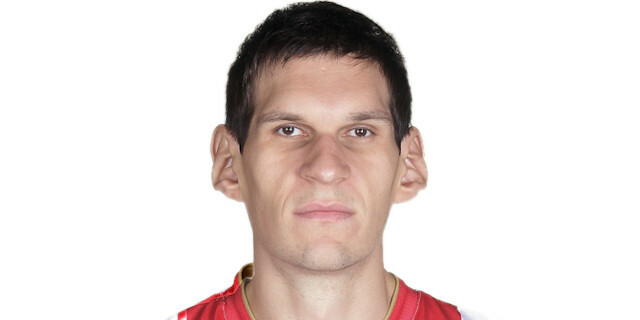 Marjanovic is very good on offense, but the best defense is to attack yourself. It went well for us, with 18 offensive rebounds and two or three guys always crashing the boards. That was one of our main objectives." "I congratulate Barcelona. They deserved to win, above all due to their good offensive rebounding. They took 18 of them from us. We started very good on offense, but then we made a lot of mistakes, above all at the end of the first and second quarters. Their lead of 11 points at halftime was impossible for us to come back from despite the efforts of my players. Also, we were unable to stop their three-point shots, especially when they were able to get that 11-point lead with their 12-0 run late in the second quarter." "I played against Boban Marjanovic for the first time, and it was not easy at all. He's very big and he also knows how to play. It was a tough matchup, but a good one. Fortunately, my teammates helped me. We have four or five players who cover the frontcourt positions and that makes rebounding easier, although I believe the key tonight was our good offensive play. Lately, we have got better at attacking." "The important thing is to win at home in the Top 16. We realize that you have to win all the games at home if you want to reach the playoffs." 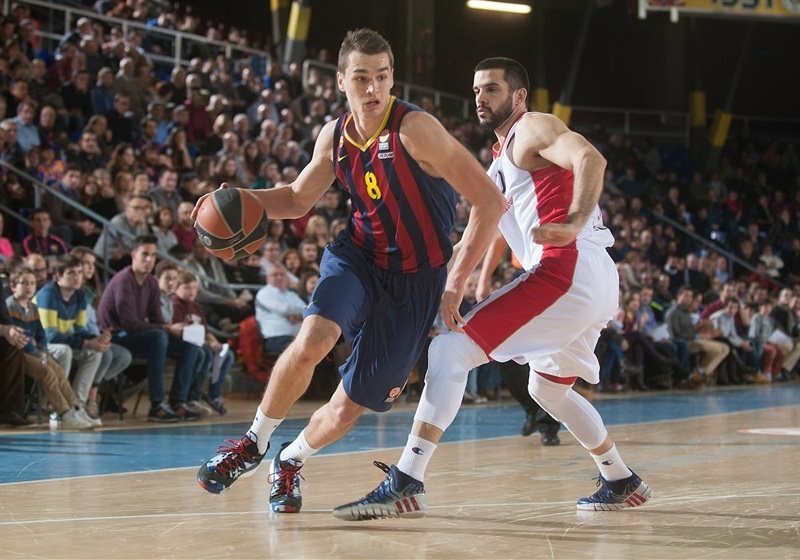 "Ante Tomic showed why he is one of the best centers in Europe. I am not used to playing against guys my size, because there are few of them. We started well but finished badly because of turnovers and letting them get 18 offensive rebounds. We didn't defend well their second chances either, after forcing them to miss the first time."